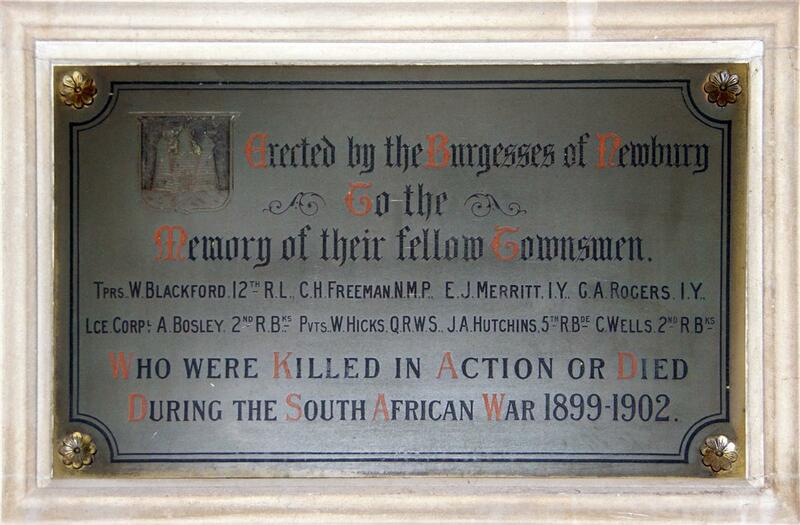 Newbury Boer War Memorial – Unveiling, 10 Nov 1902. It may be mentioned that the cost of the memorial was met out of a balance remaining to the Mayor’s credit from the £50 voted to him for the Coronation festivities from the borough funds. Mr Stephen Knight, Chairman of the Estates Committee of the Corporation (to whom the work had been entrusted), said he had much pleasure in asking the Mayor to perform what was probably his last duty from the chair, and one which was very near indeed to the Mayor’s heart, namely to unveil the memorial that had been erected to the memory of those who had fallen in the War. The Mayor said it was a source of pleasure to him to perform this duty of unveiling a memorial erected by the burgesses to their fellow townsmen who had given their services and their lives in their country’s cause at a great national crisis. They must all feel that while they recognised the services of those who had been spared to return home, they must also do honour to those who, in the providence of God, had not been permitted to return, and whose dist was now mingling on the veldt of South Africa with the great number of the sons of the Empire who had sacrificed their lves for King and country. It must be a source of pride to the townspeople that there were those to be found among them men of such valour, who had nobly performed their duty in assisting to maintain the prestige of out great Empire (Applause). The Mayor concluded by warmly congratulating Mr Allder, the engraver, on his excellent work. Mr Knight thanked the Mayor for unveiling the tablet, and mentioned that Mr Rankin’s connection with the memorial would be duly commemorated in the stonework beneath the tablet. Among those present were the parents of several of those who died in the War.